Ordeal by Innocence: Before there were movies about paranormal activity and crazed masked serial killers, there was Agatha Christie terrifying us with her “who dunnits”. I became a fan of Christie’s back in middle school when I randomly came across Ten Little Indians, a black and white 1965 film version of her novel And Then There Were None. The ending blew me away! So, when I read about a newly released Amazon mini-series of her novel, Ordeal by Innocence, I immediately started it. I ended up staying up until 1am binging all three episodes because I had to find out what happened in the Argyll house on Christmas Eve in 1956. I just had to! I then had to watch ten minutes of Queer Eye For The Straight Guy in order to not be scared of the dark anymore. It’s scary, but everyone I’ve recommended it to has become equally obsessed with it! To All The Boys I’ve Loved Before: I love a good young adult romance and this book series literally made by heart happy! High schooler Lara Jean has fallen in love many times in her life, but do any of the boys know about it? Nope! When she falls for a new crush, she writes each boy a letter and tucks them safely away in a box in her closet. There the letters remain a secret…until one day she discovers they’ve all somehow been mailed out! This novel by Jenny Han is now a made-for-Netflix movie that was just released today. I can’t wait to have a Movie Night and watch it! Crazy Rich Asians: I was late jumping on the Crazy Rich Asians bandwagon, but I’m so glad I finished the book before the movie premiered this week. I haven’t seen it yet, but friends who have are raving about it! Rachel is an economics professor in NYC and happily dating her hunky professor boyfriend, Nick. However, after dating a while she still has yet to meet his family. That all changes when they fly to Singapore for Nick’s best friend’s wedding and Rachel is thrown into a whole new world full of drama and unlimited wealth. Nick’s family and friends aren’t just rich – they are crazy rich – and it seems they aren’t fans of outsiders! 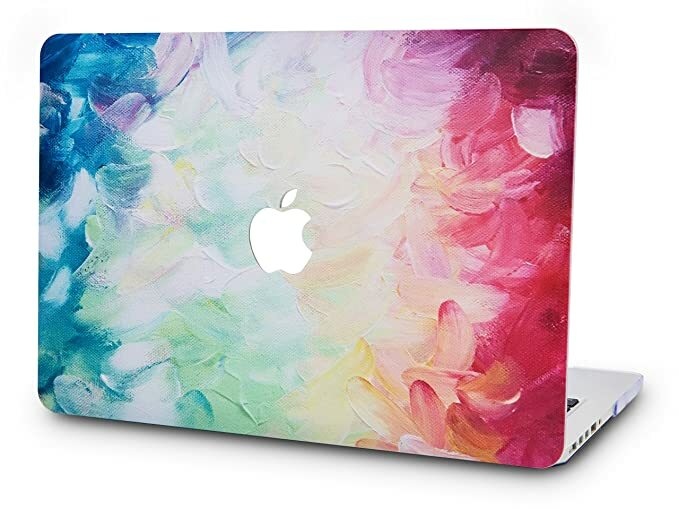 Painted Canvas Hardshell Laptop Cover: One of our office interns got this during Prime Day and I had to have one too. I’m obsessed with how real it looks in person! The Amazon vendor has a bunch of different options. I also loved the pink ombre case. WSJ Secrets of Wealthy Women: I was immediately hooked on this podcast after another podcast I enjoy recommended it. Unfortunately, the name is a little misleading in my opinion. It’s not just about wealth. This podcast interviews CEOs, politicians, designers, authors, etc. about their careers and how they climbed their way into the powerful positions they hold today. This is one of those podcasts that is so good you’ll want to go allllll the way back to the very beginning and binge so as not to miss a single episode.